In this lesson, we will learn how to differentiate between the three types of function discontinuity at a given point. A The function is continuous at 𝑥 = − 2 . B The function is discontinuous at 𝑥 = − 2 because l i m 𝑥 → − 2 𝑓 ( 𝑥 ) does not exist. C The function is discontinuous at 𝑥 = − 2 because 𝑓 ( − 2 ) ≠ 𝑓 ( 𝑥 ) l i m 𝑥 → − 2 . D The function is discontinuous at 𝑥 = − 2 because 𝑓 ( − 2 ) is undefined. Given If possible or necessary, define 𝑓 ( − 8 ) so that 𝑓 is continuous at 𝑥 = − 8 . AThe function cannot be made continuous at 𝑥 = − 8 because l i m 𝑥 → − 8 + 𝑓 ( 𝑥 ) ≠ l i m 𝑥 → − 8 − 𝑓 ( 𝑥 ) . BThe function is already continuous at 𝑥 = − 8 . C 𝑓 ( − 8 ) = 0 would make 𝑓 continuous at 𝑥 = − 8 . D 𝑓 ( − 8 ) = 6 would make 𝑓 continuous at 𝑥 = − 8 . Suppose What can be said of the continuity of 𝑓 at 𝑥 = − 1 ? A The function is continuous at 𝑥 = − 1 . B The function is discontinuous at 𝑥 = − 1 because 𝑓 ( − 1 ) ≠ 𝑓 ( 𝑥 ) l i m 𝑥 → − 1 . C The function is continuous on ℝ . D The function is discontinuous at 𝑥 = − 1 because 𝑓 ( − 1 ) is undefined. E The function is discontinuous at 𝑥 = − 1 because l i m 𝑥 → − 1 𝑓 ( 𝑥 ) does not exist. Given 𝑓 ( 𝑥 ) = 𝑥 + 𝑥 − 2 𝑥 − 1  , if possible or necessary, define 𝑓 ( 1 ) so that 𝑓 is continuous at 𝑥 = 1 . A 𝑓 ( 1 ) = 3 makes 𝑓 continuous at 𝑥 = 1 . BThe function is already continuous at 𝑥 = 1 . CThe function cannot be made continuous at 𝑥 = 1 because 𝑓 ( 1 ) is undefined. DNo value of 𝑓 ( 1 ) will make 𝑓 continuous because l i m  →  𝑓 ( 𝑥 ) does not exist. Given 𝑓 ( 𝑥 ) = 𝑥 − 6 4 𝑥 + 𝑥 − 2 0   , if possible or necessary, define 𝑓 ( 4 ) so that 𝑓 is continuous at 𝑥 = 4 . A 𝑓 ( 4 ) = 1 6 3 makes 𝑓 continuous at 𝑥 = 4 . 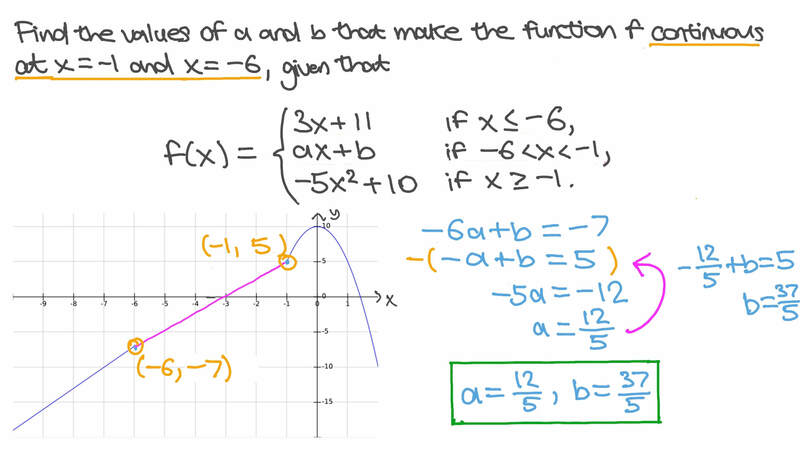 BThe function is already continuous at 𝑥 = 4 . CThe function cannot be made continuous at 𝑥 = 4 because 𝑓 ( 4 ) is undefined. DNo value of 𝑓 ( 4 ) will make 𝑓 continuous because l i m  →  𝑓 ( 𝑥 ) does not exist. A The function is discontinuous at 𝑥 = 5 because l i m 𝑥 → 5 𝑓 ( 𝑥 ) does not exist. B The function is discontinuous at 𝑥 = 5 because l i m 𝑥 → 5 𝑓 ( 𝑥 ) ≠ 𝑓 ( 5 ) . C The function is discontinuous at 𝑥 = 5 because 𝑓 ( 5 ) is undefined. D The function is continuous at 𝑥 = 5 . Setting 𝑓 ( 𝑎 ) = 5 4 and 𝑓 ( 𝑥 ) = 𝑥 − 𝑎 𝑥 − 𝑎 6 6 3 3 when 𝑥 ≠ 𝑎 makes 𝑓 continuous at 𝑥 = 𝑎 . Determine 𝑎 . What is 𝑓 ( 0 ) ? What is l i m 𝑥 → 0 − 𝑓 ( 𝑥 ) ? What is l i m 𝑥 → 0 + 𝑓 ( 𝑥 ) ? What type of discontinuity does the function 𝑓 have at 𝑥 = 0 ? AThe function 𝑓 has a removable discontinuity at 𝑥 = 0 . BThe function 𝑓 does not have a discontinuity at 𝑥 = 0 . CThe function 𝑓 has an essential discontinuity at 𝑥 = 0 . DThe function 𝑓 has a jump discontinuity at 𝑥 = 0 . AThe function 𝑓 has an essential discontinuity at 𝑥 = 0 . BThe function 𝑓 has a jump discontinuity at 𝑥 = 0 . CThe function 𝑓 has a removable discontinuity at 𝑥 = 0 . DThe function 𝑓 does not have a discontinuity at 𝑥 = 0 . AThe function is discontinuous at 𝑥 = 0 because l i m 𝑥 → 0 𝑓 ( 𝑥 ) ≠ 𝑓 ( 0 ) . 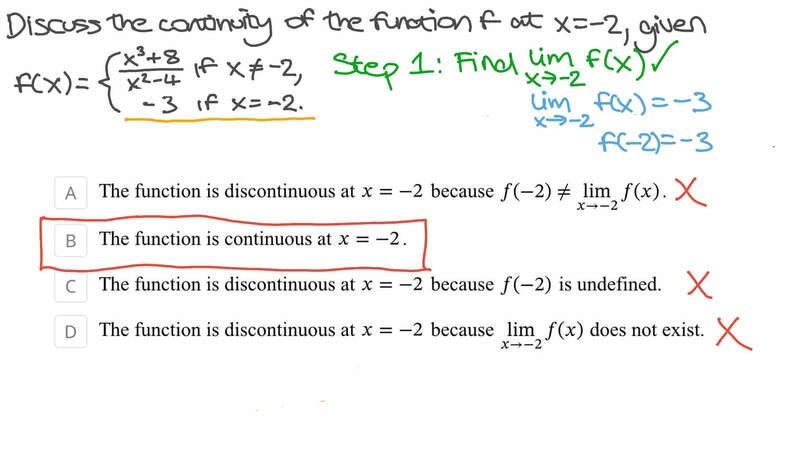 BThe function is discontinuous at 𝑥 = 0 because 𝑓 ( 0 ) is undefined. CThe function is continuous at 𝑥 = 0 . DThe function is discontinuous at 𝑥 = 0 because l i m 𝑥 → 0 𝑓 ( 𝑥 ) does not exist. The function is continuous at 𝑥 = 0 . Determine the possible values of 𝑎 .
AThe function is continuous at 𝑥 = 𝜋 2 . BThe function is discontinuous on ℝ .
CThe function is discontinuous at 𝑥 = 𝜋 2 because 𝑓  𝜋 2  is undefined. DThe function is discontinuous at 𝑥 = 𝜋 2 because l i m 𝑥 → 𝜋 2 𝑓 ( 𝑥 ) ≠ 𝑓  𝜋 2  . EThe function is discontinuous at 𝑥 = 𝜋 2 because l i m 𝑥 → 𝜋 2 𝑓 ( 𝑥 ) does not exist. BThe function is discontinuous at 𝑥 = 𝜋 2 because 𝑓  𝜋 2  is undefined. CThe function is discontinuous at 𝑥 = 𝜋 2 because l i m 𝑥 → 𝜋 2 𝑓 ( 𝑥 ) ≠ 𝑓  𝜋 2  . DThe function is discontinuous at 𝑥 = 𝜋 2 because l i m 𝑥 → 𝜋 2 𝑓 ( 𝑥 ) does not exist. Let Find all values of that make continuous at . Let Find all values of 𝑘 that make 𝑓 continuous at 𝑥 = 0 . A The function is continuous at 𝑥 = 0 . B The function is discontinuous at 𝑥 = 0 because 𝑓 ( 0 ) ≠ 𝑓 ( 𝑥 ) l i m 𝑥 → 0 . D The function is discontinuous at 𝑥 = 0 because 𝑓 ( 0 ) is undefined. E The function is discontinuous at 𝑥 = 0 because l i m 𝑥 → 0 𝑓 ( 𝑥 ) does not exist.